Today: Learn how to make this Italian classic the best it can be. The caprese salad -- a Neapolitan classic, named after the island of Capri -- is loved the world over for its simplicity and freshness. It has even become a symbol of Italian cuisine thanks to its color palate, which mimics the Italian flag. More: Take the spirit of this simple salad into your next pasta dish. Dressed only in some extra-virgin olive oil, salt, and pepper, this is a dish that calls for good ingredients. 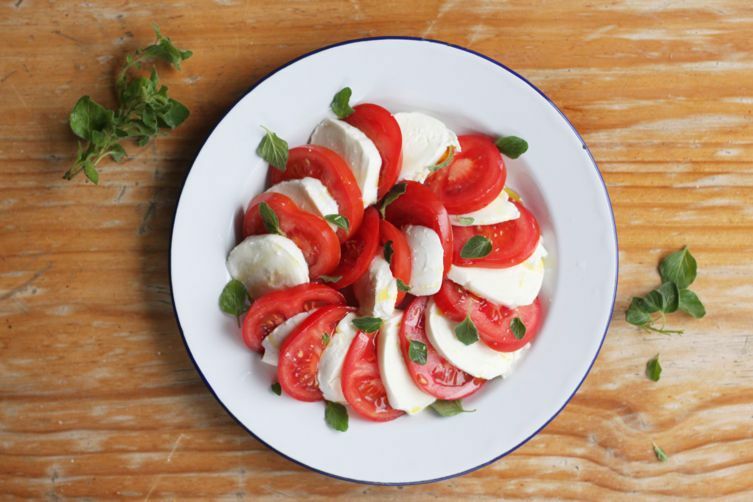 Seek out proper balls of mozzarella, weighty and as juicy as the tomatoes themselves. Perfectly ripe, sweet, summer tomatoes are a must. Try something like a beefsteak tomato or costoluto, a large ribbed tomato said to be one of the oldest varieties around. Both make great salad tomatoes, as do oblong plum tomatoes like Roma or San Marzano. Go for a very good extra-virgin olive oil, one that is fresh and zingy and hasn't been hanging around the pantry for too long. If you have time, try “marinating” the tomato slices in the olive oil and a good pinch of salt an hour or so before serving. The salt draws the water out of the tomatoes, producing a delicious juice. Combine it with the olive oil in a small jar and shake it to make your salad dressing. 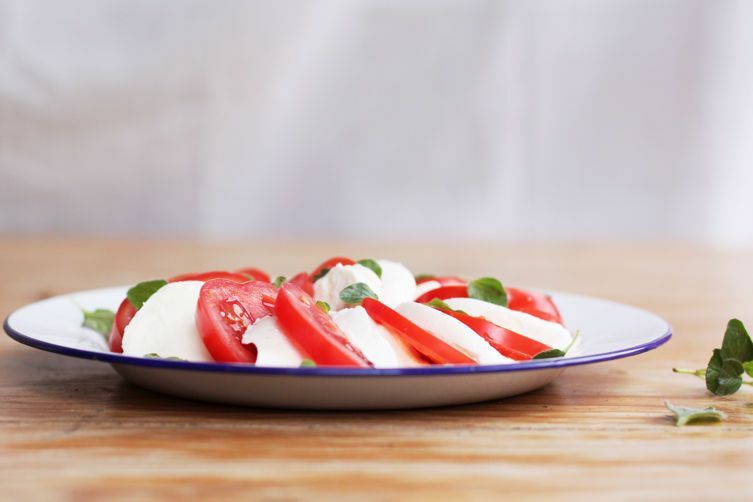 Use buffalo mozzarella. A good ball of fresh mozzarella weeps a milky liquid when cut, which will then pool in the bottom of the dish, seeping into the dressing. You'll want a few slices of fresh, crusty bread to mop it all up. Don't be shy with the olive oil. Even if you think you have used enough, always add an extra splash right before serving. More: Try your hand at homemade mozzarella. 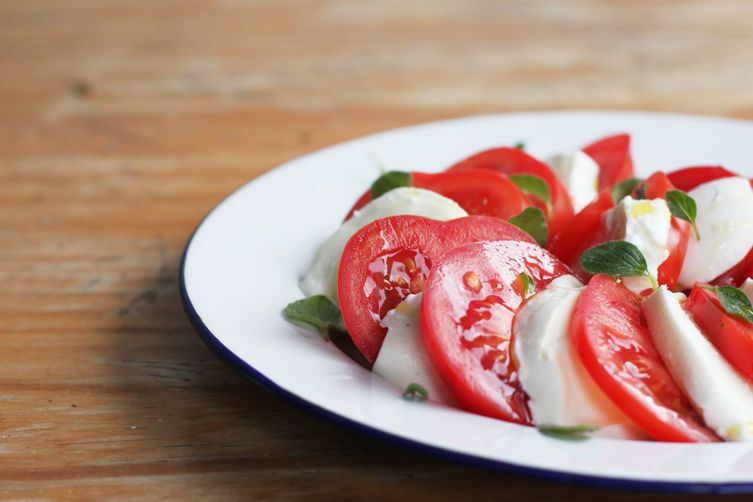 I love using fig balsamic on my caprese salad - adds a lovely extra dimension... I also put my salad on a bed of arugula for a nice spicy spin. No sooner did I hit send on my question to you that I reread the article and saw it listed in the ingredients and then I noticed the link to the detail recipe which went into even greater detail. I should read better! Thank you so much for writing back though. Off to get my fresh buffalo mozzarella balls! Not to sound too dumb, but the photo shows a green leaf that wasn't mentioned in the recipe. Is that basil? I love this with a drizzle of a nice, tart balsamic. It makes all the difference. Perfection just as it is. Thank you! I usually drizzle my caprese salad with pesto - but black olive tapenade is equally good, if not better. That's an alternative I learned from an Italian friend.